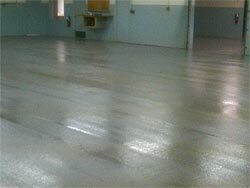 POXEPLATE® Epoxy Floor Coatings are a two component, 100% Solids Epoxy normally provided in two separate applications totaling approximately 30 to 40 Mils in thickness, and finished to a smooth or non-slip floor texture. 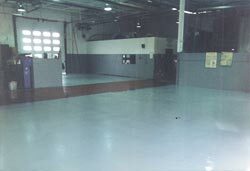 In locations where the existing concrete floor is in fair or good condition with only minor holes, cracks, or spalled concrete floor areas, a new color or clear high-gloss appearance is required, POXEPLATE® Epoxy Floor Coatings will provide excellent wear and chemical resistance while at the same time offering a new decorative appearance. The repair and resurfacing of holes, cracks, and spalled concrete floor areas can be remedied using POXEPLATE® Epoxy as a preliminary repair item, at selected locations within the overall floor area, prior to the application of the new POXEPLATE® Epoxy Floor Coatings. The extent of the required preliminary repair work is to be determined by the user's requirements as to the amount and number of the preliminary repairs to be preformed. The new coatings will provide an entirely new wearing surface that is abrasion and chemical resistant, will prevent dusting, premature wear, and will eliminate slipping hazards when applied in the non-slip texture. The Physical and Chemical Resistance data for POXEPLATE® Epoxy Floor Coatings is almost identical to standard POXEPLATE® Epoxy Floors with minor varying differences in the Physical data. POXEPLATE® Epoxy & Urethane Floor Coatings' 16 colors are identical to those offered for standard POXEPLATE® Epoxy Floors. Product Description: POXEPLATE Urethane Coatings are a two component ployester/aliphatic coating that exhibits excellent characteristics for abrasion resistance, chemical resistance, flexibility, weathering, and UV stability. This product meets the VOC requirements for the newly enacted VOC laws of New York, Pennsylvania, New Jersey, and other states as an industrial maintenance coating.